Kenneth Forrest Duncan (1881-1952) was a member of the family for whom the City of Duncan is named. He was elected the first Mayor after the City of Duncan was incorporated in 1912. 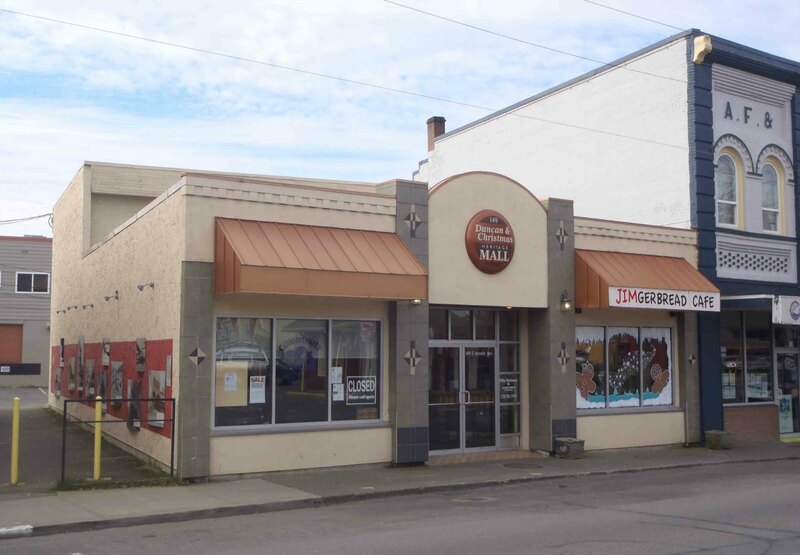 He was in business as a real estate, insurance and financial services agent with a business premises in what is now the Duncan & Christmas Heritage Mall at 149 Canada Avenue. Duncan & Christmas Heritage Mall, Canada Avenue, Duncan, B.C. This was Kenneth F. Duncan’s business premises until 1950. “Duncan – Cowichan lost one of its best known native sons in the sudden death on Monday evening [4 February 1952] at his home of Mr. Kenneth Forrest Duncan, aged 70. He had been confined to his home on Ypres Street for just over a week suffering from an attack of phlebitis, but his condition was thought to be improving. Death came with tragic suddenness about 6 p.m., a few minutes after he had been chatting with his wife. Mr. Duncan, son of the founder of the city that bears his name, was born in Duncan on March 7, 1881, and had lived here all his life. His father, the late W.C. Duncan, whose parents had lived in Sarnia, Ont., came to the district in August 1862. In 1864 he built a home on a new homestead where the city now stands. With the first pioneer, Harry Evans, he built the first St. Peter’s Church building at Quamichan in the fall of 1875. He died in May, 1919, aged 82. 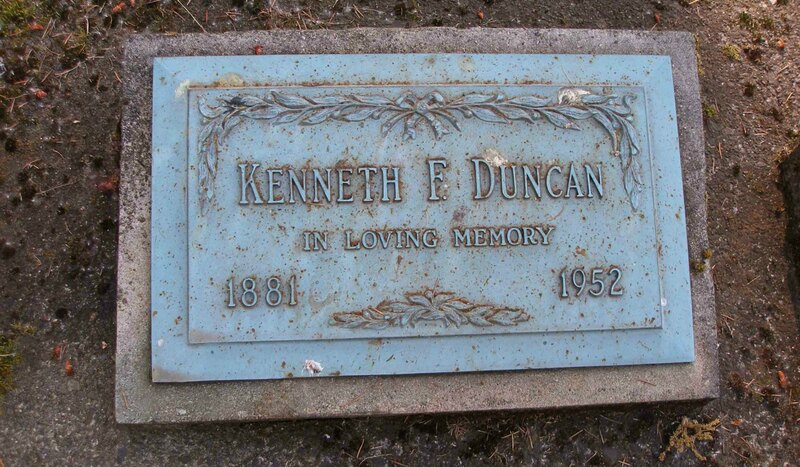 Mr. Kenneth Duncan’s mother was born on a farm in Donegal, Ireland and came to Canada in 1872. She met her husband when attending a fall fair at Maple Bay and was married in 1876 in St. Peter’s Church. She died in January 1937, aged 92. Receiving his education here and at Ottawa, where he took a course, Mr. Duncan was for many years a businessman of the city, following his profession of financial, real estate and insurance agent. He was associated first with the late J. Islay Mutter in the firm called Mutter & Duncan. This was dissolved and Mr. Duncan then had as a partner the late Herbert W. Dickie. On the last named taking over an insurance business of his own, Mr. Duncan had as his partner, the late Wilfred E. Christmas, who died suddenly two years ago. A great part of Mr. Duncan’s share of the firm, especially during latter years, was the handling of estates for residents of the district. To this type of business he brought a wealth of knowledge, good commonsense advice and kindly interest in the families with whom he was dealing. By nature he belonged to that older generation when men had more time to give thought and consideration to all problems of life. But business did not occupy his whole attention. Far from it. It can be truthfully said that few men have given more time and honest hard work than did Mr. Duncan to every community effort, small and large. To him fell the honour of being the first mayor of Duncan following the incorporation of the city in 1912. In the same year he was married to Miss Agnes Paterson, eldest daughter of the late Mr. And Mrs. Walter Paterson, Koksilah. It was in 1916 that Mr. Duncan first entered the field of politics. As a Liberal candidate he opposed the late Capt. W.H. Hayward who was seeking election as an Independent-Conservative. Mr. Duncan lost by 63 votes at the election on September 21. Enlisting in May, 1917, in the 4th Canadian Field Ambulance, Mr. Duncan went to England in November of that year and to France in February, 1918. He saw service as a private in France, Belgium and Germany. It was while serving overseas that he again became a candidate. Owing to the death of Capt. Hayward, a by-election was necessary and Mr. Duncan was nominated in January, 1919. 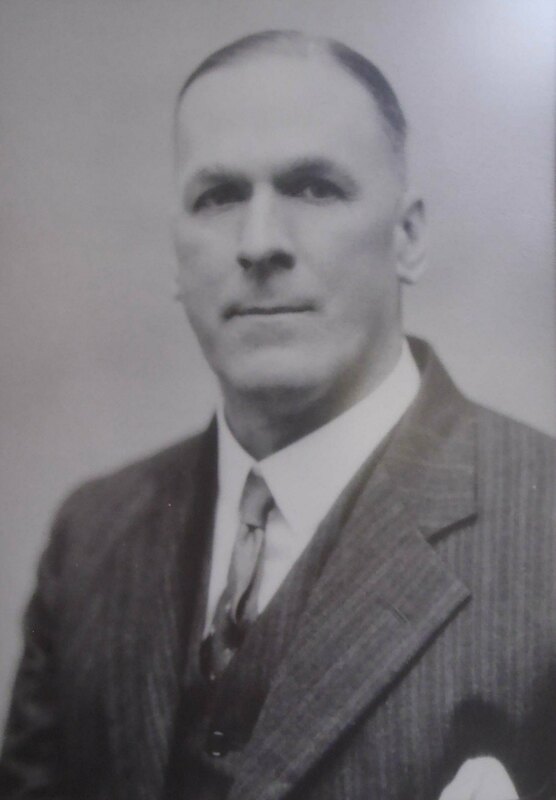 His opponent was Major Frank Basil Edwards, Victoria, running as returned men’s Independent candidate, nominated by Cowichan Great War Veterans’ Association. Mr. Duncan was nominated by the executive of Cowichan Provincial Unionist League and Cowichan Liberal Association as an Independent Soldier candidate. His agent was his brother-in-law, Mr. W.A. McAdam, now agent-general, British Columbia House, London. Won the seat by a majority of 76 at the election on January 25. He returned home on March 5, after demobilization, and immediately took his place in the legislature. The following year he was opposed by the late G.A. Cheeke, running as a Conservative, but at the December election Mr. Duncan retained his seat by a majority of 116. In April, 1924, he was again nominated, this time as a Provincial Party candidate in the newly formed Cowichan-Newcastle constituency. In a keenly contested campaign, in which the other candidates were the late C.F. Davie, K.C., Conservative, the late W.W. Walkem, Liberal, and Mr. Sam Guthrie, Labour, Mr. Duncan lost to Mr. Davie in the election, June 1924. He did not again enter the political field. For many years Mr. Duncan had been a deputy magistrate, a justice of the peace and a notary public. He held high office in Temple Lodge, A.F. & A.M., and was a charter member of Duncan Volunteer Fire Department and had for many years been on the executive board of Cowichan Agricultural Society. In 1930 he was president of Cowichan branch, Canadian Legion, and for many years president of Cowichan Branch, Canadian Red Cross Society. Last month he was again elected to its executive committee. During its active existence, he was the mainstay of the Cowichan Historical Society. He had a remarkable memory for names, dates and places and loved to recount tales of the pioneer days. Some of these he put into writing but, with his death, goes an unwritten history of the district he loved so well and whose growth from a small hamlet to a busy city centre he had assisted in so many ways. He was an eloquent speaker, especially on old time stories and events. Recently, while in semi-retirement, he had travelled far abroad and had the opportunity to visit the places in Canada about which he wished to learn more, having acquired much knowledge through his life-long hobby of reading. He took a very active interest in the affairs of King’s Daughters Hospital and served on its board for a long period. With his family of daughters, he took an especial interest in Girl Guide organisations in the district. Though sports had not occupied his attention of late years, Mr. Duncan was an ardent sportsman, the pheasant and duck shooting seasons in particular proving him an excellent shot. He played golf for many years, first on the old Koksilah course, and later on the Cowichan course in Duncan, where he was one of the better players. He also played tennis and baseball in his youth. He was an outstanding bridge player. Mr. Duncan belonged to St. John’s Anglican Church and had served on the church committee. Besides his wife, he leaves three daughters, Mrs. S.C. (Jean) Robinson, Ottawa; Mrs. Earl (Kathleen) Jacques (Duncan), and Mrs. George (Dorothy) Schuthe, Ottawa; four grandsons and two granddaughters; two sisters, Mrs. F.R. Gooding, New Westminster, and Mrs. W.A. McAdam, London, England. Another sister, Mrs. F.C. Holmes, predeceased him several years ago. He also leaves many nephews and nieces. 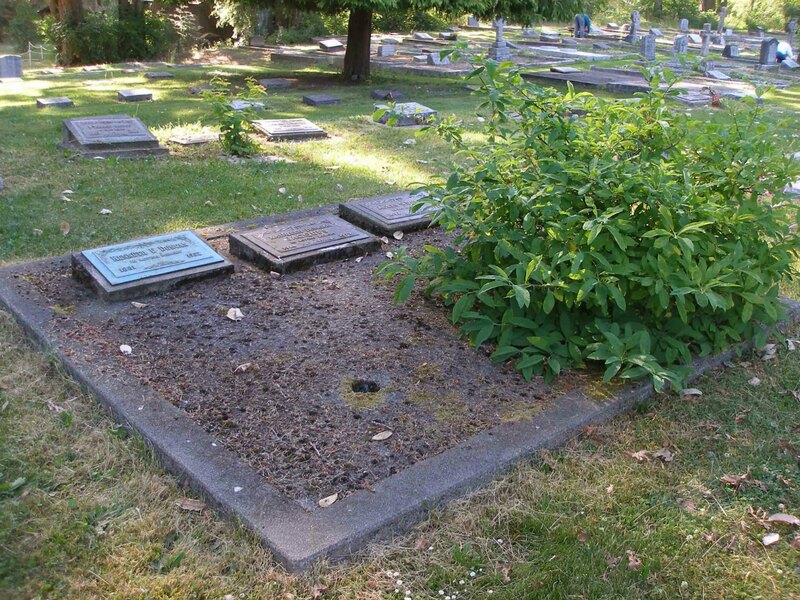 Here are some photos of Kenneth Forrest Duncan’s grave in St. Peter’s Quamichan Anglican cemetery.